Hello girls! If you haven't heard about the new MUA's SMOKIN Palette you are seriously missing out. Yep, yep! After the success of the Undressed and Undress Me Too, MUA is back with another gorgeous "handbag essential" palette. The eyeshadows included are: Mattes- Glory and Boudoir – (nudes), Ghost (dove grey), Wicked (grey shimmer), Fantasy (dark brown), Mythical (black charcoal), Shimmers- Broken (metallic brown), Icon (deep purple), Unleash (inky blue), Chaos (metallic emerald). And guess what? It is the perfect (purrrr-fect!) 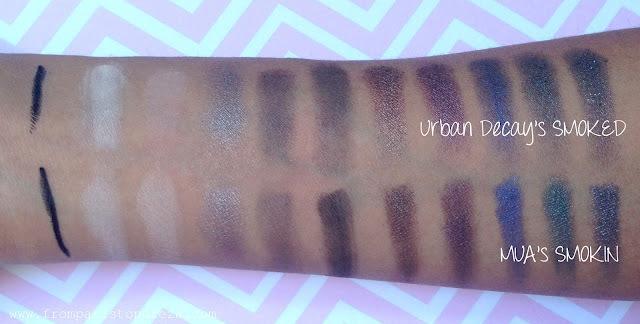 dupe for Urban Decay's Smoked Palette. So if you are a smoky eyes diva and a beauty on a budget at the same time, you'll surely love this one for sure... For the price that will not break your pocket. So what can you say? It has exactly the same lovely shades and beautiful tones. I've always been very vocal to say that UD has the best palettes (and eye pencils) in the market. But of course considering their price range, you really must expect and get what you're paying for! Luckily, MUA did another great job in offering this new Smokin Palette, another budget-friendly yet good quality product. Let me tell you one last time, this palette is GORGEOUS! PS: Don't forget to join my on-going giveaway and win 7 MUA treats! It will be finished in a few days, so better hurry!